Well, the best thing I could probably write about The Demon's Lexicon is stop reading my little blog, and go out, buy the book and experience it for yourself. It's that good. My friend Gail has been bullying me into reading these books for quite some time, and finally left me with no choice but to read them, as she sent me the entire trilogy as a combined holiday/birthday/just because present. 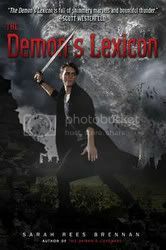 I finally sat down the other day and started the first book, The Demon's Lexicon, and read it in two sittings. I was immediately drawn into the world of the two main characters, Nick and Alan Ryves, brothers who are on the run from magicians who are trying to reclaim something from the family, an item that may have something to do with their mothers' past. When brother and sister Jaimie and Mae come to the Ryves brothers for help, secrets start to unravel themselves around everyone, all leading up to an ending that I did not see coming, and was such an attention grabber that I was kept up late into the night finishing the book on my second sitting, just so I could see how everything played out. Sarah Rees Brennan has created quite the story here. She developed such a powerful relationship between Nick and Alan that at times I felt actual concern for them and what was going to happen to them. Brennan moves the story along swiftly, but still takes time to introduce us to new characters and locations along the way. One of my favorites is the Goblin Market, somewhere I hope we get to visit again in later books. I won't give anything away about the ending, but it was quite the turn of events and deftly brought the whole story together. I'll definitely be moving right along to the other two books in the series, The Demon's Covenant and The Demon's Surrender. Do yourself a favor, go and pick up this book. You won't be sorry.